We know that Vitamin K is essential for normal blood clotting and for building and maintaining strong, healthy bones. But latest research suggests that a special form of Vitamin K, called menaquinone-7 (K2), may play an important role in blood vessel and heart health too. By supporting healthy blood vessels, Vitamin K2 may maintain optimum blood circulation - essential for healthy heart function. 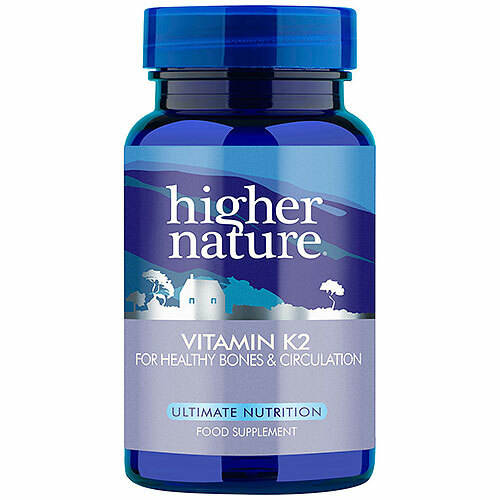 And K2 is now thought to be even more helpful in contributing to the normal structure of bone than Vitamin K1. K2 is highly bioavailable and bioactive, and remains in the blood for longer than K1. This means the body`s reserves can be built up and tissues supplied continuously. An excellent food source of Vitamin K2 is natto (fermented soya beans) - not a common Western dietary choice. Cheese and curd are also good sources, but people following a heart-health diet are recommended to reduce such foods in their diet, and they`re usually high in salt. 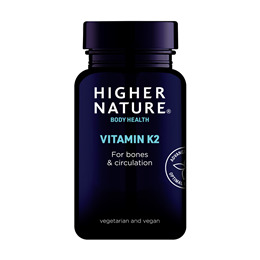 Higher Nature`s Vitamin K2 is sourced from natto and is patent protected. The optimal daily intake as determined by research is 45mcg - more is not necessary. Bulking agent: natural Lithothamnion calcarea; bulking agent: cellulose; menaquinone-7 (from soya) (antioxidant: ascorbyl palmitate), zein protein coating, anti-caking agent: magnesium stearate (vegetarian source); anti-caking agent: silicon dioxide. Does Not Contain: Artificial Colours, flavourings or preservatives, dairy products, gluten, lactose, sugar, wheat, yeast. Adults and children over 4 years: Take 1 tablet a day, or as your health professional advises. Not advisable if taking warfarin or other blood thinning medication. Below are reviews of Vitamin K2 - MenaQ7 - 30 x 45mcg Tablets by bodykind customers. If you have tried this product we'd love to hear what you think so please leave a review. We know that Vitamin K is essential for normal blood clotting and for building and maintaining strong, healthy bones. Vitamin K2 may also play an important role in blood vessel and heart health too.